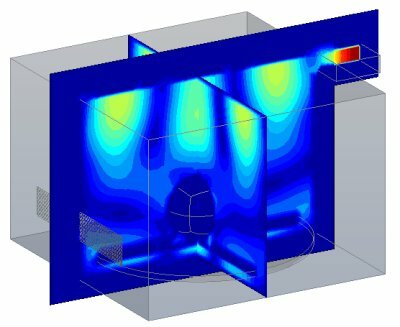 Microwave ovens of arbitrary shapes excited by coaxial or rectangular or circular waveguides can be analyzed by SINGULA . Field distribution, resonance frequency, and bandwidth of the microwave ovens can be estimated accurately. The effect of the presence of a lossy dielectric material or a conducting material with finite conductivity in side the oven, on the field distribution, resonance frequency, and the bandwidth can be calculated. Power dissipated in the lossy dielectric material and in the finite conducting material can be obtained.